The title of this document might sound a bit alarming, and with good reason. I wanted to call to your attention to something that should never be taken lightly, because it has the power to destroy an intimate relationship. 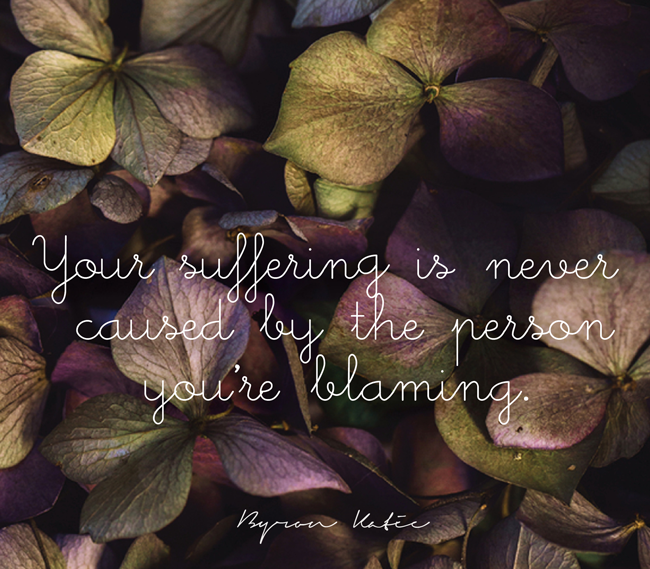 I am talking about the insidious habit called blame. That’s right, blaming your partner (or yourself) can actually become an addiction — a habit you and your partner can get hooked on, and one that slowly drains the vital energy from your relationship. Blame is the cocaine of relationships. It may even be more dangerous, because we often don’t know we are doing it, and we definitely don’t realize how bad it is for our bodies and souls. We think blame will “fix” whatever’s happening between us, or make our partner change… but it really creates more pain and distance. It works even faster than cocaine — creating an instant jolt in our bodies that is “covering up” the real issues. It “feels good” in the moment, but its self-perpetuating cycle makes it impossible for intimacy and connection. First, you’re really escaping from something else: usually emotional pain, dissatisfaction, even boredom. Because these feelings are often difficult to address and require taking responsibility, we tend to shove them away. And the easiest way to do that is through addictive behavior. The addiction serves as a distraction: You’re numbing out and not being present in the moment in an attempt to avoid facing the real issue. If you’re engaged in your addiction, you don’t have the time, the presence of mind, or the resources to deal with the underlying trigger. At the same time, you get a “rush” of adrenaline every time you engage in the addiction. The stress hormone adrenaline is secreted in your body when we feel strong emotions such as anger, triggering the “flight or fight response.” Your body is fired up, and that can feel good. The problem with adrenaline is that it makes you feel alive… but only for a short while. Whether it’s the sweetness of another slice of chocolate cake, the wishful potential of making a bet, or the physical effects of a narcotic, you’re jolting your body into feeling something — anything — different. But once the feeling wears off, it’s back to being down again — face to face with the underlying demons. You need a fast and powerful “fix,” or the demons feel like they will eat you alive. So you engage in more addiction, creating a vicious cycle that ultimately results in more pain. What Is Blame Addiction Covering Up in Your Relationship? Blame takes on a very similar pattern in intimate relationships. When you blame your partner, you temporarily take the focus off of yourself and throw it onto the other person. Instead of taking responsibility for your part in the situation, you create a distraction, and a very effective one. Blame is the ultimate cop-out. Just like a “traditional” addiction, the need for blame escalates and starts to overtake our thinking. We can’t go an hour without a critical thought, or we look for reasons to blame whenever we can. It becomes our default go-to position. But something else is also happening, and it’s a profound revelation. Conflict creates a spike in adrenaline. Blame actually works faster than cocaine, because in less than a second, your body is infused from inside. When both partners engage in blame, it can serve as a substitute for whatever is lacking in the relationship — usually intimacy and connection. Your senses are all fired up — just as they are when you’re making love — but they are senses in opposition rather than harmony. This just fuels more disconnection and conflict. Science tells us that since adrenaline wears off quickly, it creates a vicious cycle where the couple keeps escalating the conflict in order to stay in the “high.” You’re trying to replace the joyful feelings of love, connection, and intimacy — with the destructive adrenaline of fighting, frustration, and pain. Blame becomes our drug, and until we quit it — cold turkey — we become slaves to it and our relationship will never flourish. When we made the decision to eliminate blame from our lives, we were amazed by the profound amounts of positive energy and vitality that replaced it. When you stop blaming, something magical — and maybe a little scary — happens: Suddenly you have a lot more time on your hands! Time to create the relationship you want together. Time for fun, and laughter. Time for your hobbies. Time for your kids. Time for self-care. For date nights. Instead of focusing all your energy on “winning the argument” and “being right” and complaining about each other, you can now focus on what will make you happy and satisfied as a person and as a couple. Where before your mind was running in circles with critical thoughts, now you have the space to create. The cycle of addiction loses its grip, and intimacy rushes in to take its place. What couples don’t realize is that adrenaline, which drains and depletes you, is very different from the flow, or “harmonizing” hormones secreted when we are loving and feeling loved. And these hormones — unlike adrenaline — can be renewed and built on, time and again!